From the moment qualifying kicked off, it was clear the on-again, off-again nature of the rain was going to have an impact on the sessions. We saw surprises right from the start, with teams making difficult decisions, and some getting it very wrong. That continued right through to the final flying laps, where we were given an absolute treat of a final session. If you missed any of the Silverstone qualifying action, or want a quick recap of what went down on Saturday, then the Factbyte Factbox replay is here to help. Relive each session, and all the post-qualifying reaction in your own time. Both Williams and both Ferrari drivers out in Q1. Sutil beaches his Sauber in the first session, Gutiérrez leaves his in the barriers in Q2. Bianchi and Chilton finish 12th and 13th, with Max due a gearbox penalty. First Q3 runs leave Hamilton ahead, but a final burst for pole gives Rosberg the edge. Vettel and Button find time to complete the top three, with Hülkenberg on the second row too. Hello there, welcome along! This is the Factbyte Factbox for qualifying from Silverstone - following the action as the grid for this year's British Grand Prix is decided. This is the ninth round of the 2014 F1 season, and as it is the British race weekend, it's raining. Final practice this morning was damp, with both Mercedes drivers and Fernando Alonso preferring to stay in the garage rather than risk anything out on a wet track. Max Chilton had a gearbox failure in FP3 which stopped him getting any running, and has also given him a five place grid penalty for wherever he qualifies today. Lewis Hamilton is desperate to get good results here - not only to keep on track with Nico Rosberg in the championship fight, but also to give the home crowds something to cheer about. So far, most of the drivers have praised the British crowds for being super knowledgable and passionate, but mostly for sticking around come rain or shine. And today, it's mostly rain. The FIA have clarified they are continuing their zero tolerance policy regarding cars going off track as they hustle to set a fast lap. Turns 8 and 18 are particularly highlighted, and drivers will need to keep at least a couple of their wheels on track. Max Chilton's car is ready to run in qualifying, but with a five place grid penalty, you have to wonder if he can do anything to keep himself off the back row. Toto Wolff on Lewis Hamilton's frame of mind at the moment: "You always feel the pressure when you’re at home and you see the crowds cheering. He went out of the garage and people were applauding from the stands. So nice for him and so nice for the team also." Tweet from @clubforce: Ten mins to qualifying. Ten minutes until we start our battle with the stopwatch! With just a couple of minutes to go, the drivers are getting settled inside their machinery. Vettel is being strapped in, eyes wide open as he gets in the qualifying zone. Jenson Button's bright pink helmet stands out against the monochrome McLaren, the Brit running a tribute for his father this weekend. Fernando Alonso is studying the screens in front of him, as the mechanics are poised with their hands ready to whip off the tyre blankets as soon as the time is right. One of the Marussias has left the garage and headed to the end of the pit lane, waiting for the session to start. Jules Bianchi, Pastor Maldonado and two Saubers are out immediately, with several others following along behind. You'd expect many to attempt to set a banker lap whilst it's not quite raining, in case a downpour arrives. Intermediate tyres are the choices of all so far, the green striped rubber dealing with the damp conditions. There's no standing water out on track at the moment. Hamilton's radio suggests the track is very dry, so we may see slick tyres soon. 20 drivers are out on track now, with just the two Williams still in the garage. The first lap times come in courtesy of the Marussia boys and Adrian Sutil. It's Gutiérrez at the top at the moment, with a 1:46.701. Hamilton is almost a second up on that time, though, as he starts the second sector. Rosberg told his engineers it was so dry, he wanted to come straight back in, but the team urged him to stay out and complete a banker lap. Safety first, Nico! Hamilton does cross the line hugely faster than the rest, the benchmark now down to 1:43.676. Kimi Räikkönen's first flying lap is ruined, as the Ferrari driver ran wide at the final corner. Ricciardo has moved up to second, with Rosberg and then Vettel behind. A nice Mercedes/Red Bull mix there. The two Williams drivers have left the garage to complete their first laps. Hamilton questions the team regarding slick tyres, he's struggling to keep the temperatures up in those intermediates. Hamilton and Rosberg have returned to the garage, along with a handful of others through the order. Tyre decisions will be crucial on their next run. Tweet from @Marussia_F1Team: Max heads in from P17. Some tricky calls to make on tyres. It's quite dry for Inters but looking like rain. Massa has to deal with a huge oversteer wobble but keeps control and continues on his first flying lap of the afternoon. The Williams driver crosses the line in fifth place, pushing Alonso down to sixth. Meanwhile, Rosberg is asking "What is the downside of going to options?" He's told the only downside is if it doesn't rain, they will be down on tyres for the race. The drop zone currently features both Caterhams, Chilton, Sutil, Kvyat and Grosjean. Bianchi is, quite amazingly, up in 10th. Kamui Kobayashi comes into the garage, after being instructed to return by the pit wall. They have a problem and the Caterham car is pushed back in for further investigation. Cars that are heading back out on track for their second run are choosing the medium compound - the harder of the two slicks available this weekend. Everyone will have to go out again, the times will drop massively. Bianchi and Chilton drop the times by several second. Jenson Button was on a superb lap but gets that oversteer issue at the final corner and runs wide. Time will be disallowed. Brief yellow flags as Marcus Ericsson flings this way and that, then heads off track over the gravel and ends up facing the wrong way. No major damage though. Jenson Button time deleted - track limits at turn 18. Daniil Kvyat pops up to P1, as Fernando Alonso spins off track and ruins his flying lap. Alonso is currently in the drop zone. 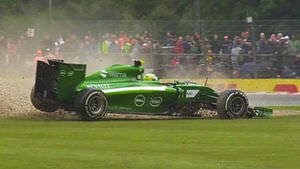 Adrian Sutil is beached in the gravel. Yellow flags as the marshals move in to recover the Sauber. Alonso's session is over, whilst Bianchi is up in fourth. The Marussia files back into the pit lane, as the first part of qualifying draws to a close. Incredible scenes with both Ferrari and Williams drivers out in the first session. Fastest three were Nico Rosberg, Daniil Kvyat and Lewis Hamilton - with a bonus mention for Jules Bianchi in fourth. Lots of incidents in the final moments of that session, but Ericsson had the most impressive off. Alonso walks down the pit lane and waves to the crowd, he looks pretty philosophical about the thing. Just a bad strategy call for the Ferrari duo. To recap what happened there: with three minutes to go it was situation normal. Bottas 5th, Massa 6th, Alonso 7th. Safely through and in the pits. That was the exact time to be on track, when Button put in his flier but messed it up. The times kept dropping, improving for Marussia and Sauber. By the time those in the pits made their way out, the rain was starting to fall again and the opportunity was over. The Marussia drivers at the end of the pit lane awaiting the session start once again. It's intermediate tyres all round once again, with ten drivers out immediately on those green stripes. Tweet from @Marussia_F1Team: Setting sail for Q2. Literally. It's tipping down but we could not be happier. Q3 boys? All cars are out on track except for Adrian Sutil, who ended Q1 in the gravel. You can see the cars kicking up spray around the track now, where previously it was drying out. Rosberg confirms via the radio that intermediate tyres are the correct choice for now. The first lap times come in, with Daniel Ricciardo posting a 1:47.980, and Jules Bianchi a couple of seconds behind. Rosberg drops the benchmark with a 1:45.292, but Lewis Hamilton follows behind with a quicker lap to move up to P1 by six tenths. Max Chilton, currently 15th, heads back to the pit lane for a quick stop. Sebastian Vettel jumps up to P1, dropping the benchmark by a further half a second. Replays show Romain Grosjean struggling to keep the Lotus on track, all four wheels disappear off to the side which means his lap time is likely to be deleted. The two Mercedes boys return to the pit lane, and there are dry tyres going on at least one of their cars. Sebastian Vettel time deleted - track limits at turn 9. That puts Hamilton back up to P1. The drop zone currently features Grosjean, Gutiérrez, Bianchi, Vettel, Chilton and of course, Sutil. Mercedes are back out on track, Daniel Ricciardo heads in for a quick change from intermediates to medium tyres. The Australian is currently splitting Hamilton and Rosberg in the top three. Romain Grosjean has his time deleted as well, the Lotus driver heads out to join the final flying laps. Just over three minutes on the clock. Esteban Gutiérrez jumps up to P1, with a 1:39.7 - the slick tyres coming into their own once again. Bianchi now moves up to the top spot, to be pushed down by Vettel and then Vergne. Two minutes on the clock and Nico Rosberg goes quickest, dropping the P1 time by a whopping three seconds. Hamilton posts a nice round 1:35.000 to take over the top spot from his teammate. Nico Hülkenberg moves out of the drop zone and up to fourth place. Yellow flags as Esteban Gutiérrez is off and into the barrier. Bianchi crosses the line for P12, not good enough to get through to the top ten but a great lap nonetheless. Grosjean can't improve on 11th, missing out on the top ten shootout. The fastest three in that session were Lewis Hamilton, Nico Rosberg and Sebastian Vettel. Team radio from mid-session to Pastor Maldonado: "We've lost fuel pressure, Pastor. Stop the car please." Replays of Gutiérrez's accident go on to show a very disappointed Monisha Kaltenborn on the pit wall. Both Sauber cars ended up off track and out of the session. Fernando Alonso: "I think it’s just, it happens sometimes in this weather. Thirty seconds before or later, you put the right tyre on in the right moment, you are in the hero part or in the mistake part. Here in the TV compound are two Ferrari drivers and two Williams, so we did something wrong compared to other teams. We need to study what happened, but there wasn’t anything we could do differently. We will start at the back, we’ll have some overtaking to do, we’ll try to do. We have zero points on the grid so nothing to lose." It's team by team again, with Mercedes, Red Bull, McLaren, Force India and Toro Rosso all fully represented in the top ten. Now Vettel has his eyes closed, concentration mode = on. The two Toro Rosso drivers head out early, joined by Sergio Pérez. In the first minute of the session, seven drivers head out on track to get a feel for the conditions at this point of qualifying. Rosberg reports there is some drizzle at Stowe. All ten drivers are on track with the medium compounds on, but onboard cameras show many rain drops. The first times are coming in, 1:40.457 for Sergio Pérez, with Kvyat and Vergne within four tenths behind him. Incident involving Pastor Maldonado and Sergio Pérez will be investigated after the session - impeding. Mercedes head up to the top, with Hamilton leading Rosberg by almost two tenths. Team radio from Jenson Button: "It's raining at Stowe. Let me know what other people do." If it does start to rain properly now, there's not going to be much change in the lap times, which would be a disappointing end to the exciting qualifying. Pérez is currently third, with Ricciardo behind him. Team radio to Jenson Button: "It looks like the rain has stopped, but we're going to box this lap and go again at the end of the session." Sebastian Vettel hasn't set a time this session. All ten drivers are now back in the pit lane as the track falls quiet. Just over three minutes on the clock, still no sign of movement in the pit lane. Jenson Button heads out on track, as the silence is broken. He's currently seventh. Six other drivers also emerge. Remaining in the garage at the moment, Ricciardo, Kvyat and Vergne. Sebastian Vettel has gone out, perhaps to set his first lap time of the session. Hamilton reports how slippery it is out there. The Brit will not want the track to improve, leaving his P1 time unchallenged. 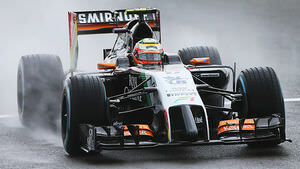 Sergio Pérez went out on track but didn't make it round in time to cross the line before the chequered flag. A waste of tyres for the Force India driver. Nico Hülkenberg goes fastest, knocked down immediately by Sebastian Vettel. Jenson Button pops up to P2, and then Nico Rosberg jumps up to P1. We were all caught out by that a bit, no one looked like they were improving but it all happened in the final sector. That was wet during the first laps and drier this time round, allowing those on laps to improve. Hamilton gave up on his lap, saving tyres due to the slippery conditions. That dropped him way down. Pole position for Nico Rosberg with a time of 1:35.766. Paddy Lowe, Mercedes, on Hamilton not finishing the lap: "He felt that the lap was worse and he bailed out, which is unfortunate because there was a lot of time found in sector three. These conditions are always very tricky… we can see it coming in, it’s the drying that is harder to predict." Vettel studies the times quickly before heading out for the top three photo opportunity. Three happy chaps out there for once. 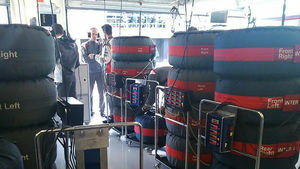 Christian Horner: "The conditions are so tricky and so isolated. We missed the right window with Seb at the beginning of the sessions, and we missed it at the end of the session with Dan. In hindsight we should have run with Dan, but we didn’t think the track would be better. It just goes to show you can never tell. It’s not Dan, he just does what he’s told… at the end of the day, as a team we made the wrong call but there’s teams that have made worse calls today." Hamilton's post-race chat shows the driver to be completely lost for words. "I don't have an answer for you right now," he says to Lee McKenzie. Shocked and disappointed. Post-qualifying press conference - Nico Rosberg: "It was quite a crazy qualifying just changing all the time. That makes it very difficult. In the end, last qualifying also, on the first lap with the soft tyres it started to rain quite a lot at the last three corners, so lost a lot of time there, and then everywhere else it was wet on the inlap. I was sure, I told the guys already that was it. We were sitting in the box, we just came to a general conclusion, might as well go out have a look at the track. "Because if you don’t have a look there is no chance, if you go out and look there’s a tiny chance, you know. It seemed like we should give it a go. Even then I still didn’t believe the track would be better. What made it was the last sector because everywhere the track was a little bit slower, because it was damp here and there, a bit wet. I knew I had lost four seconds on the previous lap, so even if I was slower than that lap, I still had the chance of going a lot quicker at those last three corners if it was dry, and that’s the way it turned out. "So just made the time on those last three corners because it was a lot drier, it just worked out perfectly. Even crossing the line on Lewis’ gearbox, I had to be there because otherwise I would have, it went red. I had to be as fast as possible to be able to do that last lap. As I crossed the line it went red, instantly, it was a close call. I think all in all it was a real team effort, everybody working together. My engineers together with me, just made all the right calls and it worked out. It’s fantastic to have such a qualifying where everything goes well in the end, and a comfortable pole in the end, it’s awesome." It's hard to describe Rosberg in the press conference there, that is one excited Mercedes driver. Once he started talking, he just couldn't stop. Post-qualifying press conference - Sebastian Vettel: "To be honest, the start of Q3, we went out I think one of the last cars. On my out lap, just preparing for the flying lap, it started to rain. I got that wet last sector to start the lap and then there was no point, we aborted the lap. At that point there was no chance to set a decent time on slick tyres, then we obviously went back in the garage, waiting. "We said we might as well go out, if we go out on inters it will be difficult to beat the lap times that have been set, so we go out on dry tyres. We were one of the first ones to go out for one flying lap in the end, it was quite difficult to believe on the out lap that it will be dry enough but it is a funny place. I think it was a very weird session, a lot of rain, no rain, drizzling, very fine rain, like spray. I think England is the only country where you can get these kind of conditions and changing so quickly. "Incredibly difficult to know what’s coming so on the flying lap, you approach turn one and turn one is a pretty big, bold corner, so it’s difficult to know how much risk you can take. Eventually you have to take some risk, especially in my case I wanted to set a lap. Obviously very happy it turned out very positive and starting from the front row tomorrow." Post-qualifying press conference - Jenson Button: "Like you could not believe. I know it’s only a third in qualifying but for us in the moment and for the last eighteen months, we had no chance of getting this result. It’s nice in front of the home crowd to qualify well. And all the way through qualifying the pace was there. Not compared to the Mercedes but with everyone else, the pace was there. "When I did my lap in Q1, on the option tyre in the dry, I was about two seconds quicker than anyone when I did it, and made the mistake of losing the rear on the last corner so it was disallowed. I thought I was going to be out. To come through and be third in Q3, it’s a good result and I’m really happy that I could do it here in front of the home crowd." What a qualifying session that was. Totally unexpected from start to finish, and just when you thought you knew what was going on, the weather kicked in and mixed things up again. It also sets things up for an intriguing race tomorrow - with fast cars right at the back of the grid, medium cars in the middle, and a mixture of cars at the top. Hamilton starting sixth, and depending on his mood will want to fight forward, but there are a couple of good defenders ahead of him. I'll be back tomorrow with lap by lap coverage for the British Grand Prix, I hope you'll join me because it's set to be a cracker of a race.